Hi my name is Dean Pettit and welcome to Space Coast Outdoors, your online resource for self-guided outdoor adventures along Florida's Space Coast, including great Fishing, Canoeing and Kayaking, Hiking, Biking, Backcountry Camping, Bird and Wildlife Watching, Surfing, and Snorkeling. In these pages are what you need to know to get the most out of your outdoor adventures along Florida's Space Coast. Also, if you are in the area be sure to check out the Local Services Directory located on the left side of each page of Space Coast Outdoors for great outdoor adventures, dining, nightlife, lodging, fishing, and more. And be sure to check out Memories and other Random Thoughts just below, a series of blog posts featuring Articles, Trip Reports, whatever, check it out! Somewhere in the collection of crap I call my stuff is a 3 ring binder with protective sheets filled with 35mm slides. One of them, I am hoping is of the photo at left, because it is of one of the coolest places I have ever paddled a boat to. In this case the boat was my first, a red 15' Coleman Canoe. 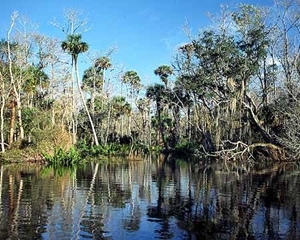 The place is called Shiloh Swamp and it can be accessed by putting in at Turnbul Creek where US 1 crosses the creek just north of the Brevard / Volusia County line. Paddling to the South from here will put you at the very northern tip of the Indian River Lagoon. However, by paddling North you the creek narrows dramatically unti it is barely wider than a canoe or kayak. About a mile up the creek, after passing by a beautiful stand of cypress and through what seems to be a wilderness canopy you come to this "pond" in the middle of the swamp. Even though it was probably less than a mile from the launch site, I felt as if I had traveled to a primordial Eden. I remember sitting in the canoe, just quietly taking it all in, letting sights and sounds imprint a photograph on my memory that no film or digital file can do justice. That's why we paddle! 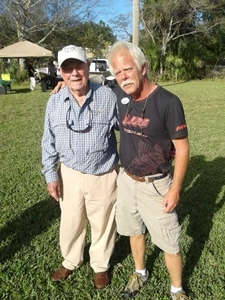 In December of 2015 while representing ACE Hardware Titusville at the Renzetti Fly Fishing Show, I had the honor of meeting and getting about a five minute one on one fly casting lesson from legendary fly fisherman and author Bernard "Lefty" Kreh. During his lifetime Lefty fished on every continent with the exception of Antartica, catching 126 species of fish in the process. He fished with US Presidents Jimmy Carter and George Bush, Baseball legend Ted Williams, Author Ernest Hemingway, and even fished for Marlin in Cuba with Fidel Castro. He also was the Author of 32 books on fishing, all of which are revered by anglers. He was also the designer of one of the most popular saltwater flies of all time, the "Lefty's Deceiver" which was honored on a first class postage stamp by the US postal service in 1991. I remember during my casting lesson he chided me for breaking my wrist during the cast. When I told him how hard it was trying to break 30 years of bad habits he laughed, "You aint getting no sympathy from me, quit breaking your damn wrist!" Watching this guy give a casting demo at the age of 90 was like watching a magician with a fly rod for a wand bring a fly line to life and have it do whatever he wanted it to. It seemed so effortless for him, he was that good. I will always remember the opportunity I had to meet and talk to this legendary angler and author. He passed away on Wednesday, March 14th 2018 at the age of 93 and will be sorely missed. For several days previous to launching my Kayak at Patillo Creek on the Merritt Island Wildlife Refuge the wind had built during the days, blowing pretty hard from the north. But I didn't want to let that stop me so my plan was pretty simple. I would launch the yak in the early morning before the wind blew in and paddle to the north, then when the wind came up I would let it carry me back to the launch site. 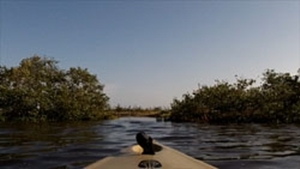 So it was calm as I lanched my Native Watercraft ltimate 12 from a spot neat the mouth of Patillo Creek and soon was paddling north along the eastern shoreline of the Indian River Lagoon. The water clarity wasn't the greatest as the wind had stirred the water for several days but for right now it was fairly calm, just a slight breeze out of the south. It was one of those days where baitfish activity was non-existent so I was relegated to pretty much blind casting, laying out a clouser minnow with my 8 weight fly rod near creek mouths and mangrove shorelines. Finally I found my approaching a shoreline with the branches of a dead tree protruding out of the water about 10 yards from the shore. 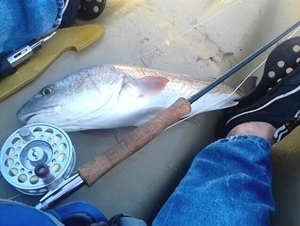 I stopped paddling, let the boat quiet down, lay the paddle accross my lap, picked up the 8 weight, and lay the clousers minnow next to the tree. The clouser minnow is tied so the hook rides up, reducing the chances of a hangup. But its not foolproof and I initially thought I had hooked a submerged branch. I didn't feel any hard strike, just a weight on the end of the line. Then I saw a swirl and the line began stripping through the guides of the rod, then off the reel. Fight On! Each time I got him fairly close to the kayak he would turn and make another run, although each run seemed to be getting shorter and less powerful. After a few runs, I was able to get him next to the kayak, cradle him into the yak, take a cell phone photo of him, the fly rod and my feet, and then spend the next few minutes carefully reviving him for the release by holding him upright in the water with the water flowing over his gills until with a rapid flip of his tail he informed me he was ready to go. It was then that I realized my plan had failed. I was thinking I could paddle north and then coast home when the wind picked up from the north, like it had for the last several days. This time however, it picked up from the south, making my trip back to the launch site a bit more challenging. Time to start paddling home to end another great day. As Fox Lake is only about a mile from my home in Titusville I tend to make alot of quick one to two hour fishing trips there. One thing I have always noticed though, People who fish from the shoreline will stand right on the shore and cast out into the lake as far as they can, while people in boats will cast to the shore. Why? Those fishing from shore are just trying to cover as much water as possible, while those fishing from a boat are casting to where the fish actually hang out, at least in the spring and early summer. Indeed on many occasions I have walked up to the shoreline, spooked a fish right at the water's edge, cast out and caught nothing. Then I revised my "approach", literally, and it has definitely helped to improve my catch rate. First of all, Park away from the water and rig up at the car or truck, not at the water's edge. I pack light when I fish, carrying one small soft tackle bag that holds a few plastic boxes with a few lures, and the rod so I can walk-n-fish. I know braided line is all the rage but I am still fond of Stren monofilament, 8# on a light spinning outfit. I tie on a 2 O' wide gap worm hook, no weight, and string on a 6-8" plastic worm, rigged weedless and usually purple in color. It's what I have always fished with. What has changed, as I mentioned before is my "approach". Instead of walking to the shoreline and casting out, I stop about 20 feet from the shoreline, and then cast 5 to 10 feet beyond the shoreline, working the worm back to the shore. When before I was lucky to catch one or two bass in an hour or two of fishing, since adopting this approach I have had days where I have caught 5-8 bass within the same time frame. 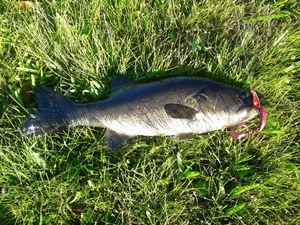 While most of them are in the 1 pound range, a few have been larger, including the 3 pounder pictured above, caught 1 ft from shore. Sometimes it is just too damn rainy, cold, and windy to go fishing and these are some of my favorite days to do just that. It's days like these where instead of paddling a kayak, wading, or setting up "fishcamp" along a shoreline and soaking a live shrimp or other natural bait, I prefer "stalking" along mangrove lined canals and creeks, and fishing in whatever small openings to the water I can find. 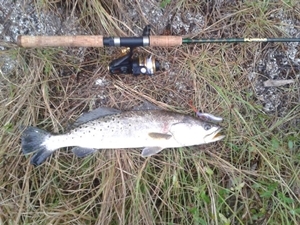 In the winter, cold snaps will drive the seatrout off of the flats to the often deeper, and warmer waters of the canals. These areas can be fishing hotspots in the winter. Using a medium action spinning outfit, I rig a 2-3 O' wide gap worm hook with no weight, and rig weedless a soft plastic D.O.A. Shad lure. My favorite colors are either the white with a red or chartreuse tail, or the "Electric Chicken" color, a combination of green and pink. Rig befor you walk, carry eveything you need in a small soft tackle bag with a sholder strap, and go Walk-N-Fish. In many places on the Merritt Island Wildlife Refuge there are trails running along canals and creeks just behind the mangroves lining the canals. However, there will be a few openings where you can cast into the canal. However before you step into these openings for a cast into the canal, approach the opening as quietly as you can. Fish have a lateral line running along each side of their body. These serve as an early warning system to the fish as they pick up vibrations in the water, including, I believe, the vibrations of your footsteps along the bank. Think of it as Trout Stalking or Hunting rather than fishing. Also don't present a visible profle. Stay off to one side of the opening behind the mangroves or back away from the water's edge if possible. The shad bait rigged weedless and weightless allows you to flip the bait quietly into the water. I try to flip it just beyond the outer edge of the mangroves on either side of the opening, then slowly twitch it back to you. Rigged as mentioned just above this bait represents a small baitfish, semi stunned by the cold, and easy prey to any seatrout holding up in the mangroves. Oftentimes, you can see the lure in the water as you're working it, and hopefully it will disappear in a flash as a hungry trout engulfs it, right at your feet! One thing I like to do before kayaking a location is to scout the area online at Google Earth, allowing me to locate and study features that I would otherwise miss from a kayak on the water. 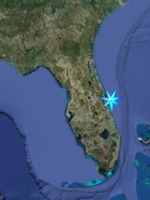 Shortly after purchasing my kayak, a Native Watercraft Ultimate 12, I found myself studying the Eddy Creek area of Canaveral Nation Seashore online at Google Earth. Now I have paddled there in a Coleman Canoe I previously owned and have enjoyed every trip, but I had never studied the area via Google. Upon closer inspection you see that the dirt for the dike road was pulled from the side of the dike opposite the actual bay or "creek", creating a shallow channel that paralells the shoreline. The dike is old and has been worn almost to the water level by years of erosion. 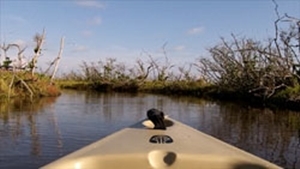 In a few locations along the dike, erosion from wind and rain has broken through the worn dike creating channels between the main body of Eddy Creek and the sorrounding channel, allowing the passage of a kayak betweeen the two. Even more interesting though are the thin natural channels that radiate outward from the surrounding dike channel, and venturing into the surrounding salt marsh wetlands to the north. Just as I had noted when scouting these areas on Google Earth, many of these side creeks are very narrow, just barely wide enough to push a kayak through. 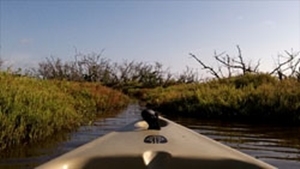 Even then it took a little effort with the salt marsh vegetation brushing against both sides of the kayak. I had to use the paddle as a push pole to force my way in. However, as I noted on Google Earth, some of these narrow openings opened into a wider impoundment surrounded by salt marsh. One of the great things about exploring an area like this via kayak is the ability to get an intamate viewpoint of an ecosystem. Its very easy to imagine that you may be the first person to venture into an area like this. This is the beauty of kayaking, the ability to get close to the incredible ecosystems most people never get the opportunity to experience. 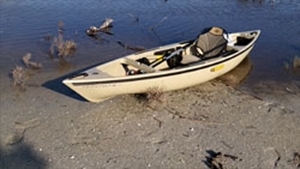 Fox Lake in Titusville is relatively unknown outside the Titusville area but is a really beautiful kayaking and freshwater fishing location located just to the west of Titusville in Northern Brevard County. From the launch site at the Fox Lake Park boat ramp you can paddle north across to a kayak landing dock that allows you access to the hiking trails of the Fox Lake Sanctuary, or you can follow the shoreline east then north as the paddling trail extends about four miles through a canal connecting Fox Lake to South Lake. 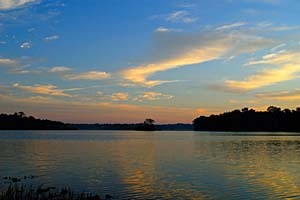 Once you get to South Lake, which is larger than Fox Lake, by following the western shoreline you come to the mouth of a creek which if you follow it to the south east will eventually open into a pond within Fox Lake Sanctuary. The mound along the shoreline of the pond is actually an Ais Indian Shell Midden dating back to Florida's pre-columbian history. Possible wildlife sightings include Sandhill Cranes, Limpkins, which feed almost exclusively on freshwater snails and mussels. Osprey, Ducks, Gulls Herons and Egrets are commonly seen, as are Alligators. In the woods of the Fox Lake Sanctuary bordering Fox and South Lakes, Deer and Turkey can be seen along with songirds and raptors. In fact there has been at least two instances of Black Bear images being captured by Game Trail Cams operated by the Brevard County EELs Program, which owns the property. Fishing is a popular sport here with catches of Largemouth Bass, Bluegill, Crappie, and the occasional Chain Pickerel all possible. To get to the launch site at Fox Lake Park from Interstate 95, take exit 215 heading east on State Road 50 for about 0.3 miles. to the stoplight for State Road 405. Turn left and head north for 2.2 miles to the stoplight for Fox Lake Road. Turn left (west) and follow Fox Lake Road until it ends at the park. Note that all watercraft must be launched from the boat ramp.